How I got this book: I did something I pretty much never do: I PRE-ordered this book and paid the full price for the hardcover (totally worth it, it's so PRETTY!!). 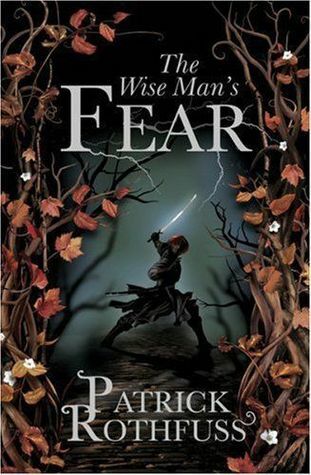 Goodreads summary: "Sequel to the extraordinary Name of the Wind, The Wise Man's Fear is the second installment of this superb fantasy trilogy from Patrick Rothfuss. Picking up the tale of Kvothe Kingkiller once again, we follow him into exile, into policital intrigue, courtship, adventure, love and magic... and further along the path that has turned Kvothe, the mightiest magician of his age, a legend in his own time, into Kote, the unassuming pub landlord. Packed with as much magic, adventure and home-grown drama as The Name of the Wind, this is a sequel in every way the equal to it's predecessor and a must-read for all fantasy fans. Readable, engaging and gripping The Wise Man's Fear is the biggest and the best new fantasy novel out there." The first day of March really couldn't come soon enough for me, it was the day I'd been waiting for at least half a year, ever since it was announced as the publishing date for The Wise Man's Fear. I read and loved The Name of the Wind (Goodreads page) a year and a half ago and was eager to continue Kvothe's story. Then came the wait. And really, it nearly killed me. Tearing my hair out, screaming, stomping of feet kind of wait. Don't get me wrong, I'm not complaining it took so long, cause I know it's a better book for it, just trying to give you a vision of how much I anticipated this book. And OMG, was it ever worth it! This book felt like hanging out with my friends, relaxing, fun, just doing something I love. This book is a good example of why I love reading. It completely took me into another world, in which magic exists, mysterious evil goes around plotting, young men can be heroes... I love the different cultures we're introduced to in this one, there's such amazing world-building going on that I can only bow to the genius that is Patrick Rothfuss. Yes, I know I'm raving and gushing. I absolutely love Kvothe, I cheer for him when he succeeds, I wince at the mistakes he makes (and some of them are pretty awful, while other are just a bit embarassing). I WANT him to do well and to finally win the girl of his dreams. He seems wise beyond his years in some things and then I'm made painfully aware of his true age when he does something foolish. And I love it. I love how he cares about his friends and is truly loyal to them. And it's not just Kvothe, I've also really come to care for his friends at school, his moneylender Devi, his teacher Elodin and the girl he moons after: Denna. And Auri, can't forget about her, she's brilliant. I especially loved a scene with Elodin, Auri and Kvothe together. There's something special about that little girl. I hope we'll get to find out more about where she's from in the next book. And Elodin, I loved how he offered one of the other teachers he could cut of Kvothe's hands if he broke a rule in the Archives in exchange for giving Kvothe access to them again. A lot of the time this isn't an edge-of-your-seat kind of story, but the storytelling is amazing and I loved seeing Kvothe grow up. I'm still left wondering how he could go from the adventurous boy to the mild-mannered innkeeper we meet in the interludes. I foresee dark times ahead in the last book. And yes, the wait will probably murder me three times over again. If you couldn't tell already: I LOVED THIS BOOK! GO READ IT RIGHT NOW! Or The Name of the Wind if you haven't read that one yet, it's so amazing! Yayyy for Patrick Rothfuss!! I love these books. I'm SO SAD we'll probably have to wait like another few years for the new one. I need to read the first one! I'm getting excited. Yay! I've been waiting for this sequel for years! I can't wait to read it!!! blog. I as well am an aspiring blog blogger but I'm still new to everything. Do you have any suggestions for beginner blog writers? I'd definitely appreciate it.